[162 Pages Report] The technical enzymes market was valued at USD 1.04 billion in 2015 and is projected to grow at a CAGR of 3.4% from 2016, to reach a value of 1.27 billion by 2021. 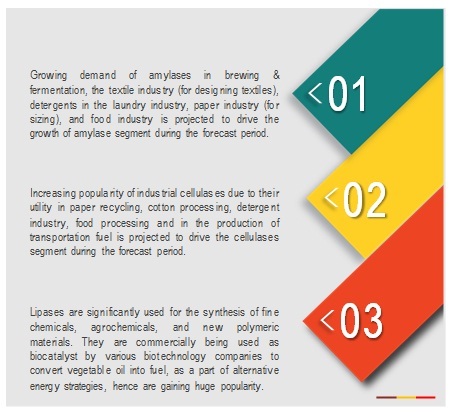 Increasing awareness and use of biofuels, rise in demand for starch processing, and the growing demand for new and fresh-arrival garments, are some of the major factors that are projected to drive the growth of technical enzymes market, globally. Enzymes are more beneficial compared to that of traditional chemical treatment. Enzymes usually lead to high product quality, low manufacturing cost, less wastage, and reduced energy consumption. Therefore, technical enzymes are widely being utilized in several applications such as bio-ethanol, textile & leather, paper & pulp, and starch processing. The base year considered for the study is 2015, and the forecast has been provided for the period between 2016 and 2021. Amylases are among the most important carbohydrases and are of great significance in the biotechnology industry, constituting a class of industrial enzymes. Amylases are those enzymes which catalyze the process of hydrolysis of sugar and starch. Amylase breaks carbohydrates (polysaccharides) into disaccharides and ultimately into monosaccharides such as glucose. Amylases find application in brewing and fermentation, the textile industry (for designing textiles), detergents in the laundry industry, paper industry (for sizing), and food industry. It plays a vital role in the starch processing and textile industries. Amylases have added advantages to the industry due to their cost effectiveness, less time and space consumption, and ease in modification and optimization of the process. Microorganisms are the best source of amylase and hence, artificial culturing of these bacteria is a prerequisite of the industry. Amylases can be used in the production of high-fructose corn syrup, as well as in alcohol production and brewing industries. In agriculture, amylase has been used to improve digestible animal feed. During this research study, major players operating in the technical enzymes market in various regions have been identified, and their offerings, regional presence, and distribution channels have been analyzed through in-depth discussions. Top-down and bottom-up approaches have been used to determine the overall market size. Sizes of the other individual markets have been estimated using the percentage splits obtained through secondary sources such as Hoovers, Bloomberg BusinessWeek, and Factiva, along with primary respondents. The entire procedure includes the study of the annual and financial reports of the top market players and extensive interviews with industry experts such as CEOs, VPs, directors, and marketing executives for key insights (both qualitative and quantitative) pertaining to the market. The figure below shows the breakdown of the primaries on the basis of the company type, designation, and region considered during the research study. The global market for technical enzymes is dominated by large players of the food & beverage industry such as BASF SE (Germany), DowDuPont (US), Associated British Foods Plc (UK), Koninklijke DSM N.V. (The Netherlands), and Novozymes A/S (Denmark). Other players include Dyadic International Inc. (US), Advanced Enzyme technology Limited (India), MAPS Enzyme Limited (India), Epygen Labs FZ LLC (UAE), and Megazyme (Ireland). In June 2015, Novozymes opened an innovation center in Lyngby. The innovation center conducts research and aims at understanding customers’ needs. The innovation center would help Novozymes to strengthen the company’s biotechnology and help in innovating products using biotechnology. In March 2015, DSM opened a Nutrition Innovation Center in Singapore. The innovation center would help in understanding the needs of the consumers in Singapore and nearby countries. The innovation center will strengthen the nutrition science and technology ecosystem in Singapore. In August 2014, BASF (Germany) inaugurated the Asia-Pacific campus and Greater China headquarters in Pudong, Shanghai (China). The expansion that was valued at USD 72.9 million signifies that BASF is undertaking expansion in the Asia-Pacific region in a rigorous manner in order to capture the maximum market share. The expansion will help BASF SE to innovate products for human and animal nutrition, personal, industrial, and home care products. In November 2014, Novozymes’ new technology offers cold bleaching to denim manufactures. Working with cold water and diminishing the utilization of the chemicals, the arrangement animates the denim bleaching prepare and secures higher quality denim. This cold bleaching technology secured improved fabric stability due to its gentle bleaching solutions. What are new application areas which the technical enzymes companies are exploring? 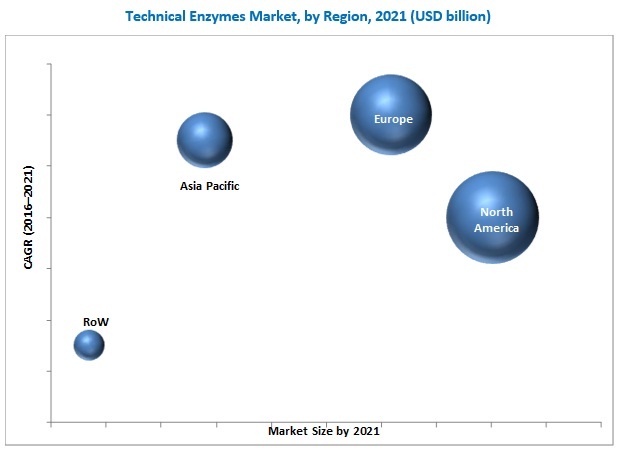 The technical enzymes market was valued at USD 1.04 billion in 2015 and is projected to grow at a CAGR of 3.4% from 2016, to reach a value of 1.27 billion by 2021. The key drivers for the market’s growth are the increasing awareness and use of biofuels, increasing demand for starch processing, and the rising demand for new and fresh-arrival garments, globally. The use of enzymes results in many benefits that cannot be obtained with traditional chemical treatment. Enzymes usually lead to high product quality, low manufacturing cost, less wastage, and reduced energy consumption. Technical enzymes are most widely used for bio-ethanol, textile & leather, paper & pulp, and starch processing applications. The technical enzymes market has been segmented, on the basis of type, cellulases, amylases, proteases, lipases and others. The market for lipases is expected to grow at the highest CAGR between 2016 and 2021. Lipases have been isolated from many species of plants, animals, bacteria, fungi and yeast. The ones extracted from microorganisms are used in various industries such as dairy, food, detergent, textile, pharmaceutical, cosmetics, and biodiesel. It is also used for the synthesis of fine chemicals, agrochemicals, and new polymeric materials. Lipase enzyme is commercially used as biocatalyst by various biotechnology companies to convert vegetable oil into fuel, as a part of alternative energy strategies. The technical enzymes market in Asia Pacific is expected to grow at the highest CAGR during the forecast period. Developing technologies, dynamic consumption patterns, and increasing disposable incomes, are some of the important factors leading to the rise in demand for technical enzymes. The shift of industrial operations such as textile and leather production from developed nations in North America and Western Europe into the Asia-Pacific region over the past decade has boosted the market for technical enzymes. The increase in population and per capita income in India and China are expected to drive the demand from end-use segments such as textile, leather, fur, wool, and other consumer goods. 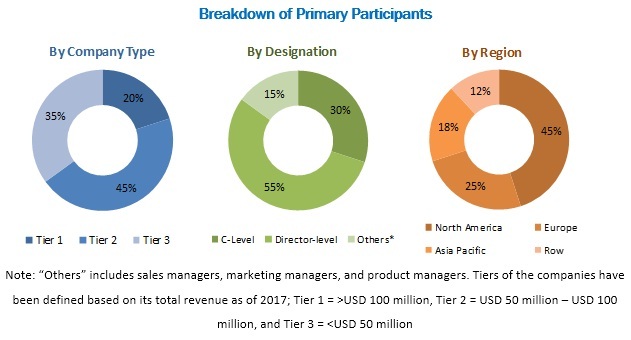 The technical enzymes market is expected to witness growth in the region on account of the rising demand for industrial goods, increasing manufacturing facilities, and increasing production capacities for textile, leather, paper & pulp, and starch. As this region has some countries that are growing at a healthier rate, there is a positive scope for the technical enzymes market. Paper & pulp is projected to be the fastest growing segment by application, during the forecast period. The technology for paper & pulp manufacture is highly diverse and ample opportunities exist for the application of technical enzymes. Traditionally, enzymes have found limited use in the paper industry, but these have been mainly confined to areas such as modifications of raw starch. Since the mid-1980s, the application of technical enzymes grew rapidly in the paper & pulp industry. For instance, xylanase is used in pre-bleaching technology, worldwide. From 1990 onwards, the use of lipase in the enzymatic pitch control method was put into practice on a large scale during paper-making process. Laccase is used in pulp bleaching, and other enzymatic applications include removal of shives and slime, retting of flax fibers, and selective removal of xylan. The production of ethanol from biomass by fungal enzymatic methods has been made possible with the advancements in technology. Ethanol (ethyl alcohol) is one of the significant products of biotechnology both in terms of value and volume. Ethanol is commonly referred to as bioethanol when it is manufactured from agricultural sources such as corn, sugarcane, wheat and wood. With intensive research & development, lignocelluloses have become the most important raw material in ethanol production. Lignocellulose is composed mainly of cellulose, hemicellulose, and lignin and it makes up most of a plant’s structure and protects the tightly-bound sugar chains within its cell walls. What are the upcoming industry applications for technical enzymes? The government restraints and regulations for technical enzymes is a major factor restraining the growth of the market. There is lack of a uniform regulatory structure for the use of technical enzymes. Stringent regulations are imposed for the use of enzymes in industries in the U.K., Canada, and the European Union. The manufacturers of enzymes need to maintain compliance with the regulations imposed by governing agencies such as Enzyme Technical Association (ETA), Association of Manufacturers & Formulators of Enzyme Products (AMFEP), and Food and Drug Administration (FDA). The use of enzymes in the food industry is as per the guidelines defined by Food Chemicals Codex. The global market for technical enzymes is dominated by large players of the food & beverage industry such as BASF SE (Germany), DowDuPont (US), Associated British Foods Plc (UK), Koninklijke DSM N.V. (The Netherlands), and Novozymes A/S (Denmark). Other players include Dyadic International Inc. (U.S.), Advanced Enzyme technology Limited (India), MAPS Enzyme Limited (India), Epygen Labs FZ LLC (UAE), and Megazyme (Ireland).